Many adults have been living with Attention-Deficit/Hyperactivity Disorder and don’t recognize it. Why? Because its symptoms are often mistaken for a stressful life. 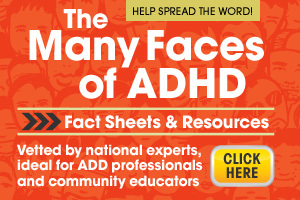 The World Health Organization developed a self screener to be used as a starting point to help you recognize the signs/symptoms of Adult ADHD. It is not meant to replace consultation with a trained healthcare professional. An accurate diagnosis can only be made through a clinical evaluation. Regardless of the questionnaire results, if you have concerns about diagnosis and treatment of Adult ADHD, please discuss your concerns with your physician. COPYRIGHT © 2003 World Health Organization (WHO). Reprinted with permission of WHO. All rights reserved.